Gatorade® appeared in 1967 and launched the sports drink market in the US. Today, sports drinks are big business. On store shelves you can find not only sports drinks, but, also, energy drinks, recovery drinks, fitness water, and many other sports nutrition products. But, they also offer the "G Series FIT" line which is also subdivided into those 3 groupings, and, another line of products known as "G Series PRO", and, yes, those, too, are subdivided into the 01, 02, and 03 groupings. So, let's see: is that nine distinct categories of sports nutrition products just from one manufacturer? Yes! According to their web site (accessed on July 22, 2011), there are a total of 22 different sports nutrition products within the entire "G Series". "Original" Gatorade® (aka "Thirst Quencher") is now part of the "02 Perform" sub-group in the "G Series" line. This one drink alone is marketed in 19 flavors!! Coca-Cola® markets 12 different versions of Powerade (web site accessed 12/21/11). "G-Series Thirst Quencher" vs. "G-Series G2 Thirst Quencher": To get a better understanding of 2 Gatorade® drinks that are in the same grouping and have nearly identical names, I went to the grocery store and bought a quart of "G Series Thirst Quencher" (this is the new name for the original formula of Gatorade) and a quart of "G Series G2 Thirst Quencher" (this is a low-calorie version). Both of them are part of the "02 Perform" subcategory. • Calories: The "Nutrition Facts" panel for original Gatorade is based on a 12-fl. oz. serving size whereas the low-calorie version uses an 8-fl. oz serving size. Confusing! Why did they do this? Perhaps, to exaggerate the perceived calorie difference between the 2 formulations? If you don't realize the nutritional details on the labels are based on different serving sizes, the calorie difference appears to be 80 vs. 20. The calorie difference is actually 80 vs. 30 if you compare equal volumes of the 2 beverages. • Electrolytes: At first glance, the "original" formula appears to contain more sodium and potassium than the low-calorie version. However, equal volumes of these 2 products have essentially the same amounts of sodium and potassium. • Artificial sweeteners: Note that the low-calorie version uses acesulfame and sucralose as artificial sweeteners. Taste is highly subjective, but, I definitely preferred the original formula (orange) over the low-calorie version (raspberry melon). • Cost: Both drinks cost $1.49/32 fl. oz. In the following discussion, I will review and compare sports drinks. It is interesting to compare the carbohydrate and sodium content of commercial sports drinks to more common food items. For fun (or, perhaps, for the benefit of the St. Pete Mad Dogs Triathlon Club....), I included the details for Guinness draught in some of the tables. Finally, "energy" drinks, a very non-specific term, are discussed in a separate review (see "Energy Drinks"). According to a presentation by Robert Murray, PhD, Director of the Gatorade Sports Science Institute, at the ACSM Annual Meeting, the European Union defines sports drinks as beverages that contain carbohydrate in a concentration range of 2.0 - 8.75%, with an osmolality of less than 400 mOsm. Gatorade® and the other "first generation" of sports rehydration beverages on the market today contain a combination of several carbohydrates with several electrolytes. Generally, first generation sports drinks serve 2 roles: (a) rehydration and (b) fuel for exercising muscles. However, in the past several years, "recovery" drinks have become mainstream; ie., you can now purchase these beverages at any national grocery chain. These drinks combine amino acids or protein with carbohydrates and electrolytes. Amazingly, up until 1969, athletes were discouraged from consuming fluids while running. It was thought that drinking fluids would impair performance. Since then, hundreds of scientific studies have examined every aspect of these beverages on athletic performance. Today we know that performance falls as an athlete loses fluids (Armstrong LE, et al. 1985). When Robert Cade, MD, invented Gatorade® at the University of Florida, the goal was to find a better way to hydrate college athletes who were perspiring heavily in the hot Florida sun. But, despite their popularity, are (protein-free) sports drinks like "original" Gatorade® any better than plain water? Currently, the prevailing opinion is that plain water is an adequate rehydration beverage for the average weekend warrior, if exercise lasts less than 60 minutes, and/or perspiration is not excessive. However, water by itself is not the best rehydration beverage during strenuous activities. Drinking plain water shuts down the sensation of thirst too quickly. Many athletes stop drinking too soon. When Puerto Rican soccer players were left to drink plain water on their own, they were still significantly dehydrated (Leiper JB, et al. 2001). A thirsty person drinks more fluid when the beverage contains sodium (and flavoring) compared to plain water. Obviously, the easiest way to correct this is to get athletes to drink more water, however this can backfire. Drinking too much water without also taking in sodium can lead to hyponatremia, a serious medical condition where the concentration of sodium in the blood gets too low. This has been documented in marathon runners (Almond CSD, et al. 2005) and in soldiers during training. In rare cases, hyponatremia can be fatal (Ayus JC, et al. 2000). Sports drinks contain varying amounts of sodium, often with other electrolytes. As discussed above, the addition of sodium not only helps to prevent the development of hyponatremia, but also encourages an athlete to drink more. Thus, because sports drinks contain sodium, they are a better choice than plain water when perspiring heavily. However, most sports drinks don't really contain very much sodium. electrolyte replacement drink 110 mg 30 mg 10 cal. Powerade Zero 100 mg 25 mg 0 cal. Gatorade GatorLytes 780 mg 400 mg 0 cal. The Right Stuff 1780 mg 0 mg 0 cal. Nevertheless, people taking diuretics and those with health problems, particularly hypertension, congestive heart failure, and kidney disease, should consult their personal physician before increasing their sodium intake. While rehydration continues to be a major reason to consume sports drinks, it is their ability to furnish rapidly-absorbed carbohydrates that is arguably even more important. Hundreds of research studies over the past 3 decades have proven that ingesting carbohydrates during prolonged strenuous exercise enhances performance compared to plain water (Hawley JA, et al. 1992). However, when the carbohydrate concentration in a beverage increases above 8%, gastric emptying slows (Mitchell JB, et al. 1989) (Murray R, et al. 1999). This is a critical factor in the development of sports drinks since strenuous exercise by itself can affect gastric emptying: as exercise intensity increases, the rate of gastric emptying decreases (Moodley D, et al. 1992; Leiper JB, et al. 2001). Thus, if you drink beverages with a carbohydrate concentration greater than 8% while exercising hard, not only does this impair the delivery of fuel to exercising muscles, you may be more likely to develop GI intolerance (stomach cramps, vomiting). 14.2 - 18.9 grams per 8 oz. 21.3 - 28.4 grams per 12 oz. Original Gatorade® and many of their newer beverages contain 14 grams of carbohydrate per 8 oz serving. This equals a 5.8% solution. CytoMax Performance Plus contains 5.4%. By comparison, fruit juices contain roughly 10% carbohydrate and soft drinks contain 10-12% carbohydrate. Further, it has been shown that absorption and oxidation of carbohydrates during strenuous exercise is optimized if carbs are supplied in a mixture of several types, as opposed to a single carbohydrate source (Jentjens RL, et al. 2004a; 2004b). The carbohydrates in Gatorade® come from a mixture of sucrose syrup and glucose-fructose syrup. Just as carbohydrate-containing sports drinks are superior to plain water for improving performance, it now appears that sports drinks that contain a mixture of carbs+protein (aka: "recovery" drinks) have advantages over the traditional carbohydrate-only types. Carb+protein drinks appear to be more efficient at increasing both muscle glycogen (Zawadzki KM, et al. 1992) and muscle protein (Miller SL, et al. 2003) after strenuous exercise. Several studies show that exercise performance is better in athletes who consume carb+protein beverages compared to athletes who received the carbohydrate-only type (Ivy JL, et al. 2003) (Saunders MJ, et al. 2004). However, these studies have been criticized on the fact that more total calories were given to the group receiving the carb+protein formula. Saunders et al. (2004) counter that argument by pointing out that the athletes more than offset these extra calories in the amount of effort expended during the carb+protein phase of the study. Further, muscle injury and/or soreness may be less when protein is ingested after strenuous exercise. Several studies show that creatine kinase (CK) levels (a marker for muscle injury) are lower if a combination of carb+protein is consumed immediately following exercise (Pritchett K, et al. 2009). So, even if carb+protein drinks don't improve performance over the traditional carbohydrate-only-type beverages, they may have another claim to fame: more rapid muscle recovery (hence the name "recovery" drinks). In fact, the benefits of consuming a carb+protein mixture immediately after a strenuous workout also appear as better health: Marine recruits who received protein supplementation immediately post-exercise not only had less muscle soreness, but, during their 54-day basic training, had a lower rate of medical visits due to muscle/joint problems and bacteria/viral infections (Flakoll PJ, et al. 2004). Obviously, as the table above illustrates, the carb:protein ratio found in these drinks varies by a wide range. So, how can this information be used? In fact, is it even something to consider at all? 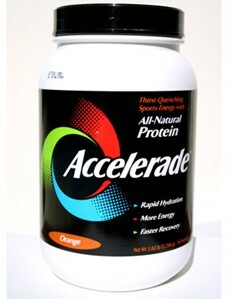 First, one should note that PacificHealth Laboratories, the manufacturer of Accelerade® and Endurox R4®, obtained a patent on sports drinks containing a carb:protein ratio of 4:1 in 2006. Thus, because of that, other manufacturers are forced to adopt a different ratio. 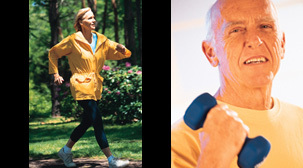 The PacificHealth Labs web site lists dozens of research studies here. "The addition of protein to a post-workout drink may provide amino acids that can reduce the breakdown of existing muscle protein." "The most important factor for optimal recovery is consuming enough calories, because muscle protein breakdown has been shown to occur when energy intake is too low, regardless of the amount of dietary protein ingested." Many of the benefits of commercial carb+protein products have also been demonstrated for milk, including better recovery and lower CK levels. The carb:protein ratio of milk is 1.5-to-1. So, there you have it. The carb:protein ratio should not be the only criteria you use when selecting a recovery drink. For example, let's say that a sports drink contained 4 grams of carbohydrates and 1 gram of protein. In this case, it would provide that 4:1 carb:protein ratio that PacificHealth Labs touts as being so critical, however, the total amounts of these 2 nutrients are so low that it wouldn't qualify as a recovery drink. Thus, the other elements of a carb+protein product may be more important. For example, if you have perspired heavily, and rehydration is your primary need, then selecting a sports drink with a relatively low carbohydrate concentration may become the deciding factor so as to avoid stomach cramps (ie., beverages with higher concentrations of carbohydrate may be more prone to inducing GI distress). This may be less of an issue post-race than during the race, but is, nevertheless, something you might want to experiment with...ie., finding the drink that you tolerate the best. What is probably more important than the formula of the recovery drink is WHEN you consume it. Skeletal muscles uptake carbohydrates and amino acids most readily during the 45 minute period immediately after exercise stops. Your muscles don't care whether the carbs and protein come from a recovery drink, chocolate milk, bagels with peanut butter, or some other source. At this point, you may be asking, "aren't 'energy' drinks and 'sports' drinks just different names for the same category of beverage?" No. Energy drinks and sports drinks are clearly different, though, admittedly, there is quite a bit of overlap. For example, Gatorade calls its Performance Series sports beverage an "energy drink" and the tag-line on Powerade's® label is currently "liquid hydration + energy drink". However, these beverages contain the desired concentration of carbs and no caffeine, so I grouped them with the sports drinks listed above. Generally, beverages categorized as energy drinks contain a lot of caffeine (or herbal sources of caffeine), a high carbohydrate concentration, and not much else. One of the most popular products on the market in this category is Red Bull®. The carbohydrate concentration of almost all energy drinks is typically much higher than the sports drinks described above (Gatorade Performance Series being an exception). The carbohydrate concentration of most energy drinks ranges 11-15%, making them unsuitable for consumption during competition. Thus, energy drinks are not much different than soft drinks such as Coca-Cola® or Mountain Dew®, except for the fact that other substances such as herbs, amino acids, and vitamins are sometimes thrown in. It's important that athletes can differentiate caffeine-based energy drinks from true sports drinks. The ideal sports drink contains a proper amount of carbs and electrolytes with, generally, no caffeine and no vitamins. Energy drinks are reviewed in detail in another story (see Energy Drinks). • TOO CONCENTRATED: Many sports drinks are sold in large containers of bulk powder. This allows the user to add as much -- or, as little -- water as they wish. If the resulting mixture is too concentrated, the osmolality could be too high, leading to GI distress (stomach cramps, vomiting). Ingesting excessive electrolytes could also pose a problem, however, most sports drinks don't contain enough electrolytes for this to be a concern. The sodium replacement product "The Right Stuff" contains 1780 mg sodium per serving. The manufacturer recommends that this be diluted in no less than 16-oz. of water (personal communication, 8/10/11). • TOOTH DECAY: Sports drinks may be good for our bodies, but not so good for our teeth. Any beverage that contains sugars can coat the tooth surface and promote tooth decay. • WEIGHT GAIN IN KIDS: At first, you might think: "How can sports drinks promote weight gain if I am only using them when I exercise?" Certainly, that's true, but children and adolescents are drinking them whether or not they exercise. carb+protein smoothie 1.1 g/fl.oz. 1.1 : 1 $2.99/330ml $0.27/fl.oz. milk, 1% fat 1.1 g/fl.oz. 1.4 : 1 $1.79/half-gal. $0.03/fl.oz. Q: You made comparisons to milk several times in this review. Is there any research on milk as a substitute for sports drinks or recovery drinks? ANSWER: Yes! One of the first definitive studies on milk -- specifically, chocolate milk -- was published in Feb. 2006. Chocolate milk was compared to original (ie., protein-free) Gatorade® and Endurox R-4® (carb+protein drink) in 9 highly-trained cyclists at Indiana U. Even though the nutrient profiles of chocolate milk and Endurox R-4® are very similar, exercise performance was better after drinking chocolate milk than after drinking Endurox R-4®. The authors speculated that the higher fat content of chocolate milk (5.3 g) vs. Endurox R-4® (1.5 g) might have been a factor (Karp JR, et al. 2006). A similar study in the UK, published in 2009, showed that subjects cycled longer during a 2nd exercise session if they had consumed chocolate milk as a "recovery beverage" immediately following the first exercise session (Thomas K, et al. 2009). Milk has also been shown to be a better choice for hydration/rehydration than a standard sports drink (Shirreffs SM, et al. 2007). Not all studies are positive, however. One study showed that, even though muscle CK levels were lower in cyclists who consumed chocolate milk post-exercise, their exercise performance 15-18 hrs later was no different whether they consumed chocolate milk or a carbohydrate sports drink (Pritchett K, et al. 2009). Nevertheless, others who have reviewed this topic have concluded that milk seems to be a satisfactory "recovery" drink after either endurance exercise or resistance exercise (Roy BD. 2008). ANSWER: Glycerol occurs naturally in the body. It has been used IV and orally in clinical medicine and has been studied in athletes for more than 25 years because of its ability to retain body water. During exercise in hot climates, glycerol helps to regulate body temperature (Robergs RA, et al. 1998). But the real question is: does glycerol have any effects on exercise performance? Several studies have been done, but the results vary. Glycerol improved performance during cycling (Anderson MJ, et al. 2001) (Montner P, et al. 1996) and mountain biking (Wingo JE, et al. 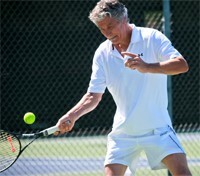 2004), but was not helpful in tennis players (Magal M, et al. 2003) or triathletes (Inder WJ, et al. 1998). The dose employed in these studies was similar (generally in the range of 1.0-1.2 g/kg). While researching these products, I did not come across any sports drinks that contained glycerol. But, it is possible to purchase glycerol separately. Before trying it, athletes need to keep 2 things in mind: Glycerol can cause GI intolerance. This is important because it has a short half-life, and, therefore, must be ingested just prior to competition. Also, at one time, the USOC considered glycerol a banned substance (it was classified as a diuretic). This ruling was changed in 1997. WADA and NCAA ban diuretics; on the WADA list, glycerol is banned under the category "plasma expanders." Competitive athletes should investigate it before use in competition. This amount of sodium is not harmful....sports drinks contain much less sodium than foods like cheeseburgers, fries, and potato chips. If plain water is the only liquid available during a race, then try to eat some salty pretzels during and after the event. • Carbohydrates: Taking in carbohydrates while exercising or competing is now universally accepted as beneficial. According to most sports nutritionists, the optimum "dose" is 60 grams of carbs per hour during a lengthy race (Van Essen, et al. 2006). If you use a sports drink, look for one with a carbohydrate concentration of 4-6%. If you mix your own from powder, make sure the concentration is not more than 8% in order to avoid GI distress during your race. • Carbohydrate-only sports drinks vs. carb+protein sports drinks: Personally, I feel that as long as the carb+protein sports drinks don't cause GI intolerance, they should be considered. 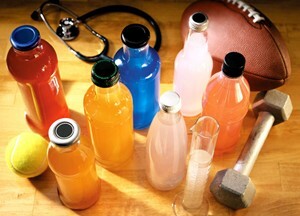 Research does show that the carb+protein drinks may have an advantage over sports drinks that do not contain protein. Ignoring the criticisms regarding study design, these beverages may enhance recovery even if they don't improve performance. But, as with anything else, test it during a training run before using it during a race to see if it agrees with your GI tract. Products with a carb concentration of >8% (for example, Endurox R-4®) should be limited to post-race consumption to avoid GI distress. • Caffeine: If you don't want a sports drink with caffeine, then simply avoid those. Most sports drinks don't contain caffeine, so you have plenty of choices. "Caffeine" has to be listed on the label, but you must also watch for herbal sources of caffeine, such as "guarana". Guarana contains 3-6% caffeine. That's much higher than the amount in coffee beans (1-2%) or dried tea leaves (1-4%). • The PacificHealth Labs web site (manufacturer of Accelerade® and Endurox R-4®) contains some good information: www.PacificHealthLabs.com. • An interesting web site that reviews beverages from a commercial perspective is: www.BevNet.com. Here, you can read short reviews of beverages and look up ingredients, though, for some products, a more comprehensive ingredient list was found on the manufacturer's product-specific site. A good text on sports drinks was written by Robert Murray, PhD, and Ron Maughan (University Medical School, Aberdeen, Scotland): Sports Drinks - Basic Science and Practical Aspects (CRC Press, 2001). Details regarding the ingredients of the products summarized here were obtained from manufacturer web sites, and from actual product labels during July 2011. DISCLOSURE: Neither the author, nor AthleteInMe.com®, has any relationships with any of the products or manufacturers mentioned in this review that would constitute a conflict-of-interest.